PETALING JAYA: Sunway City Bhd (SunCity) is looking at a strong recovery from the dampened sales inflicted by the global financial crisis and plans to move on with its planned property projects both locally and abroad. According to SunCity managing director for property development Ngian Siew Siong, the local property market had not been too badly impacted by the global crisis and it should recover quite fast. “Demand for property is a function of economic growth and, with the country’s economy expected to bounce back next year, property demand should also move in tandem with the higher market confidence,” he said. For the fourth quarter ended June 30, SunCity’s property sales showed a strong rebound of 120% to RM88mil from RM40mil in the previous quarter. The stronger sales were mainly due to improving consumer sentiment and the launch of the “Triple Z Series” promotion in April. Sunway SPK Villa Manja’s semi-detached residences showed a stronger take-up with RM57mil sales during the quarter compared with RM8mil in the preceding quarter. However, year-to-date revenue was down 16.8% to RM1.09bil compared with the previous corresponding period while earnings before interest and tax dropped 7.8% to RM331.1mil. Property development earnings, which dropped 39.6% year-on-year due to lower sales and construction progress, were the main culprit. For the current financial year, SunCity will be changing its financial year-end from June 30 to Dec 31. To further boost its RM743mil unbilled sales, which will provide more than a year’s earnings visibility for the company, SunCity is planning over RM1bil in new launches next year. The projects include Sunway Velocity in Jalan Peel, Sunway-SPK townhouses, South Quay condominiums, and Sunway Damansara zero-lot bungalows. SunCity would also be launching its India and China projects next year. “We have already done our homework and feasibility studies on both countries and we like what we saw there. There is a growing middle-class population and the higher purchasing power is translating into greater demand for housing,” Ngian said. With a population of 1.3 billion in China and 1.2 billion in India, the two countries make up 40% of the world population. The sheer size and growth prospects were very attractive, he added. For its maiden project in China, SunCity has partnered with Sunway Holdings Bhd’s subsidiary, SunwayMas Sdn Bhd, and Shanghai Guanghao Real Estate Development Group Co Ltd for a mixed high-rise development in the central business district of Jiangyin New Harbour City in Jiangsu Province. The 39:26:35 joint venture to develop the RM492mil project will be launched in mid-2010. The Sunway Guanghou Jiangyin project will have 1,172 medium-end condominiums and some specialty shops on about 17 acres. “We believe our maiden project in China will be our platform to secure other future property projects in this high growth country, especially in tier-two cities,” Ngian said. In India, SunCity’s maiden project, Sunway Opus Grand in Hyderabad with a gross development value of RM1.17bil, is also targeted for launch next year. The 35-acre project will comprise 2,423 medium-range condominiums priced from RM193 per sq ft.
Ngian said India was still a very young country as far as progress in property development was concerned, and SunCity’s expertise in project design, quality and management capability had opened up immense opportunities to play a bigger role in its property market. Its preferred cities include Hyderabad, Bangalore and Pune. Hyderabad tops the list as its growth is fuelled by the information technology and biotech industries. Besides a huge demand for quality housing, Grade-A commercial properties are also in short supply in India. KUALA LUMPUR: The outlook for the domestic construction sector looks positive in the fourth quarter, but the roll-out of major projects will likely only happen next year, analysts and industry players said. Ng Kee Leen ... 'Developers must be market driven'. Master Builders Association Malaysia (MBAM) president Ng Kee Leen said there was certainly greater optimism of a revival in the construction sector, thanks mainly to the Government’s stimulus packages and overall improvement in the global economy. “We are definitely seeing more tenders and small public works jobs being dished out in recent months, but most of the bigger or mega projects are likely to be rolled out next year,” he told StarBiz recently. The construction sector grew 1.1% in the first quarter but contracted 2.8% in the second. “We expect the third and fourth quarter results to be positive,” he said, adding that the construction sector’s growth for the whole of 2009 could be 3%. The construction sector remains attractive, especially since material costs such as sand, steel and cement prices have stablised, he said. However, Ng advised construction players, especially developers in the sector, to not just build “more of the same” and expect the market to mop up whatever they build. “Developers must be market driven to build projects that are wanted by the community,” he said, adding that there was now more interest in energy-saving buildings that embraced the green concept. According to Ng, the construction sector’s yearly turnover was around RM60bil. “About 50% of this turnover are from government projects and the balance from private initiated investments,” he said, adding that much of the government spending was for infrastructure development, including road works. Ng noted that developers were also more confident of the property sector’s growth, with some unlisted ones like GSB Sentral Sdn Bhd, a member of the diversified Gapurna Group, having already started groundworks on its 348 Sentral development – a green property project with a gross development value RM1.1bil to be completed 2012. GSB Sentral director Imran Salim said the company was very confident of the project’s success going by the 60% uptake of floor space of the building by its main tenant – Shell Malaysia. Datuk Osman Abu Bakar, the secretary-general of the Malay Contractors Association which represents some 7,000 bumiputra contractors, said many of the projects dished out so far by the Government were for smaller projects. “There are more tenders and small construction projects out these days and our members have benefited from these projects as our members are mostly Class F contractors,” he said. A member of the Indian Contractors’ Association said he had benefited from the Government’s simulus packages. “Most of the contracts we’ve secured are small roadworks projects. However, our company has not derived any benefits or jobs from mega projects,” he said. A construction analyst with OSK Research concurred that the construction sector was on the road to recovery and that players in the market, from developers and contractors to real estate agents, were definitely more optimistic of the sector’s growth going forward. “There are more property launches by developers and more tenders this third and fourth quarters. This is a good sign. But many contractors are waiting for more mega projects to be rolled out, which we suspect will occur next year,” he said. The billion-ringgit projects that are likely to be rolled out or have been confirmed include the RM9bil Pahang-Selangor interstate raw water transfer project, the RM7bil Kelana Jaya and Ampang light rail transit line extension works and the construction of the low-cost terminal, according to the OSK analyst. A construction analyst from another brokerage said that while there were early signs that the construction sector was recovering, the rollout pace of major projects remained slow. “Also, now that the global economy appears to be on the mend, we wonder if the mega projects proposed when the economy was in a downturn will be implemented,” the analyst said. RIYADH: Saudi Arabia's Dar Al-Arkan said yesterday it would spend 7.5 billion riyals (100 riyals = RM92.64) over a period of five years on a new residential project in Jeddah. Construction on the new project, which will have more than 10,000 units, will begin in 2010, according to a statement on the bourse website. Dar al-Arkan Real Estate Development Co, Saudi Arabia's largest developer by market value, on Saturday reported a 14.4 per cent drop in third-quarter net profit due to a property sector slowdown. The company made a net profit of 616.2 million riyals in the three months to Sept 30, down from 719.5 million riyals a year earlier, it said in a statement on the Saudi bourse website. 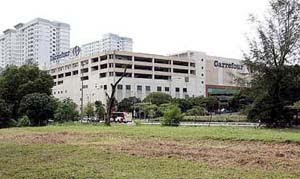 "The decline in third-quarter net profit ... is due to the higher profit margin (made) during the third quarter of last year, itself due to the growth recorded by the real estate market throughout much of 2008," it said. Revenues stood at 1.52 billion riyals in the three-month period, up from 1.48 billion riyals a year earlier, it added. "The (revenues') growth of 2.8 per cent reflects the stability of the property market," it said. RIYADH (Saudi Arabia): Jabal Omar Development Co has invited greater Malaysian participation, including Tabung Haji, in the 24ha real estate project near the Grand Mosque in Mecca. International Trade and Industry Minister Datuk Mustapa Mohamed, who is on the final leg of his week-long trade and investment mission to three Arab countries, said the project involves 18 billion Saudi riyal (RM17 billion). "Work has started. They are inviting Malaysian investors, including Tabung Haji, to rent part of the area that is under development," he said here last Saturday. "God willing, we are able to hold meetings with the relevant parties in Malaysia to encourage them to invest in this project." Jabal Omar Development Co, listed on the Saudi Stock Exchange, is the real estate investment, development and property manager of Jabal Omar. The project, aimed mainly at providing better housing facilities for pilgrims, will have 92 multi-storey buildings, 27 five-star and four-star hotels, parking for 12,000 vehicles, commercial centres, 4,500 shops and 3,000 showrooms, a central transport station, and prayer facilities for 202,000 worshippers. The land and infrastructure part of the project is scheduled for completion next year. Mustapa said that he had also been briefed by Saudi Arabia-Malaysia Business Council chairman Dr Sheikh Ghassan Al-Sulaiman on the possibility of enhancing further bilateral cooperation, including the participation of Malaysian companies in several integrated tourism projects. "In the past, they relied too much on oil and gas. Today, they all want to diversify their economies, and I was briefed that tourism is one of the sectors in focus." Mustapa added that the sector was open not only for Saudis but also for people in the Gulf region. "Therefore, the opportunity for Malaysian companies is really good." Maybank Investment Bank Bhd has rated Glomac Bhd, a Malaysian developer, a new “buy” with a target price of RM1.78. The research outfit said Glomac will record "explosive” earnings growth over 2009 to 2012, driven by high-margin commercial projects. The shares of Glomac Bhd rose 4 per cent to RM1.31, set for the highest level since February 18, 2008. It has been almost a month since Syarikat Prasarana Negara Bhd revealed its preferred alignments for the proposed extension to the Kelana Jaya and Ampang LRT lines. Since then, there have been numerous calls by residents and stakeholders requesting that the exact locations of the stations be identified. Having a clear idea of where these stations are located would help people provide feedback, comments and suggestions to the proposed lines as well as prevent any confusion in future that might hamper the project. Several locations have been proposed and it is believed that the most of the stations will be within a 500m radius of these locations with some exceptions. The Kelana Jaya line starts from the Kelana Jaya station, passing through Subang Jaya and USJ, before ending at Putra Heights, covering 17km, with 13 new stations. There are two stations in Petaling Jaya, while Subang Jaya has seven stations located along Jalan Jengka and Persiaran Kewajipan and three stations in Putra Heights. The line will have five stations with multi-storey park-and-ride facilities. The Ampang line, which spans 17.7km, starts at the Sri Petaling station and passes through the Kinrara and Puchong industrial zones before ending at Putra Heights. It has 13 stations, with six multi-storey carpark and park-and-ride facilities, including Putra Heights. Two stations are located in Kuala Lumpur, while 10 stations are in Puchong. The 35km of lines, which are estimated to cost about RM7bil, will be elevated and are expected to be ready by 2012. For those wanting to make comments and objections, note that the display hours are from Monday to Friday from 9am to 5pm. It is closed on Saturdays, Sundays and public holidays. Views should be in writing and submitted to the Department of Railways director-general’s office before Dec 14. For details call 03-2278 1222 or visit www.dor.gov.my.